The firs few pics is right on! And it seems I can use it for the m151a1 I have! 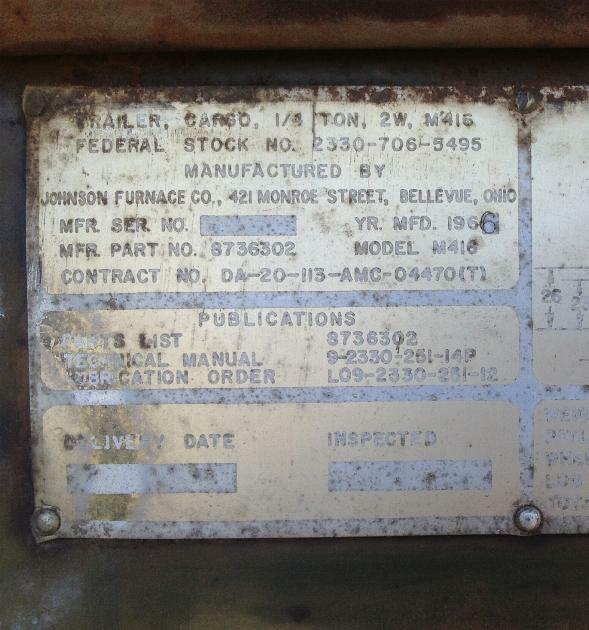 1966 I already stamp a 6 on the original data plate on the tail gate. Much thanks! Maybe trace holes and rebuild inside framing, but I don't know, I have ( to many shoves and not enof operator ) projects... Also much thanks to all. The silicone seems to be working, but any better data plate restoration ideals. When my mom past away my siblings were arguing about this huge vase my dad got in Vietnam. My sisters really got in to it, and one told the other" mom wanted Marky( this is me) to have the vase Because dad got it in Vietnam when Marky was born" ( I didn't want it after the argument- way to blow it, with my mom dieing in the other room) : well turnds out my dad was in Vietnam in 1964-some time after I turned one, a hole year!) I have grater respect for my oldest brother now- disabled Iraq vet )My mom had 5 kids, what a feasco that must have been...my dad was in communication as a civil servant work for dod...from end of ww2 in Japan( were he met my mom) through koria, Vietnam, till the 1984 when he retired in hawaii...my dad would probly know everything about this radio stuff. To bad he's gone; ironically when we had him and my mom placed in Punch bole national cemitary, my brother Steve pointed out "wow look at all the 442 graves " my dad said he wanted to stay in Japan. Sorry about the long story... Anyhow much thanks to all, I should change the flore pan in the m416 as it has holes. But in all its prity sound. That is a great photograph! Yep, I welded up all them freeking bolt holes in mine along with two 30 cal. bullet holes, well one going in, and the other exiting the other side. I sure wish I did a better job of researching before I returned mine back to a standard M416. My rest job would have taken about half the time. Whoever welded all the brackets did a darn good job. It took me hours of careful grinding and cutting to get them off. It just goes to show.... When you get something, research it, then wait a few days/week before doing any work on it. Pray for our Wolf Hunters. Last edited by muttguru on January 29th, 2016, 4:45 am, edited 1 time in total. Hi Ken I should have waited to see if in fact I should have not stamped a 6 as year of manufacturing 1966. So you say its a 1965, from contract. Oh well one year off, can't really chaing it back unless I get new contractors data plate. I also will take your advice and keep it restored all original...Will possibly incorporate the holes for a storage deck and plywood bed,.with the tall canopy it will be a good camper, and not a modification! But as with my M1008 I had a tarp on the back; they nead to be properly tie down, or it will rip in high winds/traveling speed. Last edited by Macdog530 on January 29th, 2016, 1:12 pm, edited 1 time in total. Hello Mark, sorry about that. I'll delete the white trailer pic. I'd saved the pics in a combined M112 folder and then uploaded them all to your post !